In the Standard Model of particle physics, a meson is a composite subatomic particle comprising one quark and one antiquark. Mesons are part of the hadron particle family—particles made of quarks. The other members of the hadron family are the baryons—subatomic particles comprising three quarks. The main difference between mesons and baryons is that mesons are bosons having an integer spin, while baryons are fermions having half-integer spin. All mesons are unstable. Searches for exotic mesons that have different constituents are ongoing. Since mesons are composed of quarks, they participate in both the weak and strong interactions. Mesons with net electric charge also participate in the electromagnetic interaction. They are classified according to their quark content, total angular momentum, parity, and various other properties such as C-parity and G-parity. While no meson is stable, those of lower mass are nonetheless more stable than the most massive mesons, and are easier to observe and study in particle accelerators or in cosmic ray experiments. They are also typically less massive than baryons, meaning that they are more easily produced in experiments, and will exhibit higher energy phenomena sooner than baryons would. 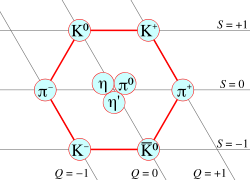 The mesons that scientists have most often detected are pions (pi mesons) and kaons (K mesons). Mesons of spin 1 form a nonet. The residual strong force, which is responsible for holding protons and neutrons together in atomic nuclei, is currently explained mainly in terms of the exchange of mesons such as pions. Japanese theoretical physicist Hideki Yukawa was the first to predict the existence of mesons, in 1935. He suggested that they are carriers of the force that binds protons and neutrons together in atomic nuclei. For his prediction, Yukawa was awarded the Nobel Prize in Physics in 1949. Yukawa called the particle meson, from the Greek word mesos, meaning "intermediate," because its mass was between that of an electron and a proton. He had originally named it mesotron, but was corrected by Werner Heisenberg (whose father was a professor in Greek at the University of Munich), who pointed out that there is no "tr" in the Greek word mesos. The muon, when first discovered, was thought of as a meson, based on its similar mass and was named "mu meson." However, it did not show a strong attraction to nuclear matter and was found to be a lepton. The pion was the first true meson to be discovered. Cecil Powell made the discovery in 1947. Current theoretical models of intranuclear forces are quite complicated, but they are based on the notion that nucleon-nucleon interactions are mediated by meson exchange. A pion (pi meson) is constituted of an up or down quark and an antiquark. For instance, a pi-plus meson consists of an up quark and an anti-down quark. A kaon (K meson) consists of one up or down quark or antiquark and one strange quark or antiquark. For instance, a K-plus meson is made of an up quark and an anti-strange quark. Pseudoscalar mesons (spin 0), where the quark and antiquark have opposite spin, have the lowest rest energy. Next lowest in rest energy are vector mesons (spin 1), where the quark and antiquark have parallel spin. Both come in higher-energy versions, where the spin is augmented by orbital angular momentum. The name of a meson is devised so as to indicate its main properties. Conversely, given a meson's properties, its name is clearly determined. The naming conventions fall in two categories based on "flavor:" Flavorless mesons and flavored mesons. Flavorless mesons are those mesons for which flavor quantum numbers are all equal to zero. This means that these quarks are quarkonium states (quark-antiquark pairs of the same flavor) or a linear superposition of such states. When L and S are added together, the result is a total angular momentum quantum number J, with values ranging from |L−S| to L+S in single-unit increments. The different possibilities are summarized with the use of the term symbol 2S+1LJ (a letter code is used instead of the actual value of L) and the symbol JPC (here only the sign is used for P and C). ‡ Second row contains pairs of elements: φ is supposed to be a state, and ω a state. In the other cases, the exact composition is not known, so a prime is used to distinguish the two forms. The normal spin-parity series is formed by those mesons where P=(−1)J. In the normal series, S = 1 so PC = +1 (i.e., P = C). This corresponds to some of the triplet states (triplet states appear in the last two columns). 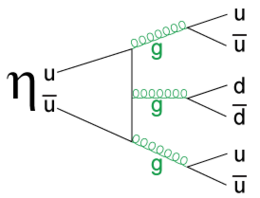 Feynman diagram of one mode in which the eta particle can decay into three pions by gluon emission. In this scheme, particles with JP = 0− are known as pseudoscalars, and mesons with JP = 1− are called vectors. For particles other than those, the number J is added as a subindex: a0, a1, χc1, and so on. For most of ψ, Υ and χ states it is common to include spectroscopic information: Υ(1S), Υ(2S). The first number is the principal quantum number, and the letter is the spectroscopic notation for L. Multiplicity is omitted since it is implied by the symbol, and J appears as a subindex when needed: χb2(1P). If spectroscopic information is not available, mass is used instead: Υ(9460). However, exotic mesons with "forbidden" quantum numbers JPC = 0− −, 0+ −, 1− +, 2+ −, 3− +… would use the same convention as the meson with identical JP numbers, but adding a J subindex. A meson with isospin 0 and JPC = 1− + would be denoted ω1. 1. The meson name is given by the heavier of the two quarks. The order of quarks from heaviest to lightest is: t > b > c > s > d > u. However, u and d do not carry any flavor, so they do not influence the naming scheme. Quark t never forms hadrons, but a symbol for t-containing mesons is reserved anyway. For s and b quarks we get an antiparticle symbol. This is because the adopted convention is that flavor charge and electric charge must agree in sign. This is also true for the third component of isospin: Quark up has positive I3 and charge, quark down has negative charge and I3. The effect of that is: any flavor of a charged meson has the same sign as the meson's electric charge. ↑ Quarks and antiquarks that impart quantum numbers to hadrons are called "valence" quarks. In addition, any hadron may contain an indefinite number of virtual quarks, antiquarks and gluons that contribute nothing to the quantum numbers. Such virtual quarks are called "sea" quarks. ↑ 3.0 3.1 3.2 Hadrons: Baryons and Mesons Stanford Linear Accelerator Center. Retrieved September 11, 2008. Cottingham, W.N., and D.A. Greenwood. 2007. An Introduction to the Standard Model of Particle Physics, 2nd ed. Cambridge, UK: Cambridge University Press. ISBN 978-0521852494. Martin, B.R. 2006. Nuclear and Particle Physics: An Introduction. Chichester: John Wiley. ISBN 978-0470025321. Santra, A.B., S. Kailas, and R.S. Bhalerao (eds.). 2004. Mesons and Quarks. Workshop on 'Mesons and Quarks.' New Delhi: Narosa Pub. House. Fermilab's CDF scientists make it official: They have discovered the quick-change behavior of the Bs meson, which switches between matter and antimatter 3 trillion times a second Fermilab Press Release, September 25, 2006. This page was last modified on 18 September 2018, at 16:33.